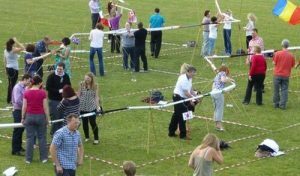 Posts tagged "Team Building Games"
No organization can negate the importance of an effective team and to build that companies organize various team building programs. Having a strong team is good for organizations in more than one ways. Not just it results in stronger performance but it also ensures that employees stay associated with the company for longer. Well, there are various ways of building a strong team and games and fun activities one of them. Engaging in any kind of playful activity makes a person happy from within. Not only this, it helps in inculcating relationships, abilities to solve problem and come up with new ideas. Compared to other ways, games are never boring and promise a good break from work. Help in establishing stronger bond with co-workers, team leaders etc. Help strike a balance between different strengths and weaknesses to get optimum results. Help people relax and have a break from monotonous life. To make meetings at work more interesting, you can plan to induce some games or fun activities into it. 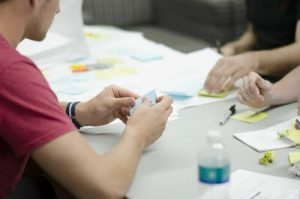 As a manager, you can even decide your team members to gather post working hours and have one of the team members do all the planning in context of the meeting, but make sure he keeps it short without losing on the main point. Do not miss on arranging some refreshment and maintain the element of surprise to keep all the team members excited to know what is going to happen. Attending meetings every now and then surely becomes boring and monotonous. And games at work are a great way of inducing some fun time. Here are some tips that can be of great help to you. Arrange team building activities at least once a year. You can go for more such activities as they help connect people. Planning outings is definitely a great idea. Focus completely on the games and say a big no to work on that day. If possible then you can arrange for some outdoor activity that is a different experience. For instance, a cooking competition seems to be a great thing. In case you don’t have the budget or the time then you can include some fun activities during or after the meeting on a regular day. So don’t just let your employees work, allow them to have some relaxation time which will help them bond better, go beyond their targets to work as a stronger team. A little play time can charge up their bodies and brains and will them focus better and perform better. Don’t wait and start planning some playful activities to build stronger teams and have a stronger organization. All work and no play surely make life very dull. To make sure that your team is highly energetic and beautifully synchronized, corporate team building games are always a good choice. Fun-filled indoor team building activities for corporate are not just a great idea to break the monotony at work but also a wonderful way to induce team building skills in the employees. 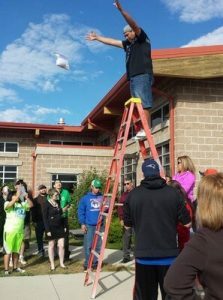 If you cannot arrange for an outdoor visit, you can utilize free indoor time with these unique team building activities and programs that induce learning without killing the fun of the games. 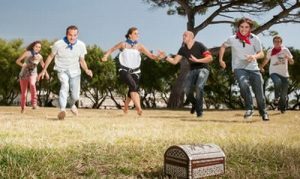 Being the manager, if you are looking for indoor team building activities for youth, this post unveils some of the most entertaining and interesting corporate games for fun which ensure great learning. 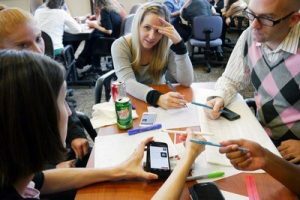 Include these corporate team building activities to give your employees a break from work by engaging them in activities that develop team building skills and inter-personal skills that help them perform better at work. Let us have a look at these wonderful indoor team building activities for youth that you can try with your team. Make a team of 2-5 people and given them a pair of scissors with a pack of poker cards. They will need to create a poker tower using the things allotted to them. This is a game of 15-20 minutes which intends to develop team building and innovation in the participants. 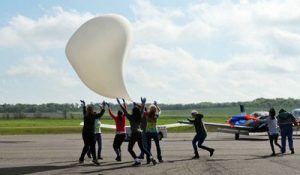 It starts simple with teams given a set number of balloons with instructions to keep them in the air using just one touch. Gradually the numbers of balloons are increased making it a difficult task. The aim of this game is to develop coordination between the group members. Make teams of 2-3 people. Give each team tape, balloons, plastic, newspaper, rubber bands, straws etc. and a set time of an hour to create a package of eggs which keeps the eggs intact when they are dropped from 2nd or 3rd floor. Each team is allotted a code and the team which is able to crack the code wins the game. The idea of this game is to develop problem solving skills and teamwork between the members. In a hall arrange the mines like cones, bottles, squares etc. from one end to another in a random pattern. Create teams with two persons in each. Blindfold one member and now ask him to go from one corner to another without touching these mines based on instructions given by the other member. Take a long piece of string and place everyone around it forming a circle. Let them hold the string to the height of their waist. Now with their eyes closed, they ask them to form different geometric shapes. This is quite a challenging game with form rectangles, triangles, octagons etc. without opening their eyes. This fun activity involves a big group in even numbers. Create papers with pair of things like honey and jam, Mickey and Minnie, salt and pepper etc. Tape one paper at the back of each person without letting him know what’s written on it. As the game starts, each one has to find out what’s written on his paper by asking simple yes and no questions. Team is made to stand in a circle and two hula hoops are introduced to the group at different points. Now the team has to move the hoop in the circle without breaking the chain of hands. This activity demands coordination and skill to accomplish this goal effectively. It is quite a fun activity which requires a group of 4-6 people standing in a circle. It starts with juggling one ball with one touch at a time. More balls are added to see how many balls can stay in the air. This activity is all about mental alertness and coordination with team members. 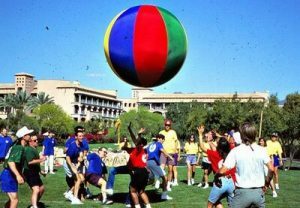 With a large inflatable ball, the team is suppose to keep the ball in the air for the longest time possible and make sure that every team member has touched it before it finally falls the ground. This is an amazing activity when the numbers of team members are quite large. These are some of the entertaining, exciting and learning corporate team building games which make amazing choices of indoor games which can be easily played in the office during coffee breaks or weekends. They surely develop group coordination, individual skills and mental effectiveness. 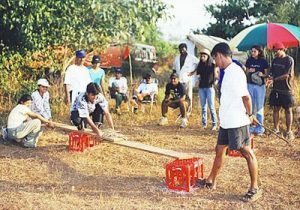 To know about equally energetic and vivacious outdoor corporate games, click here. Life and learning are not just limited to office boundaries. Taking your employees outside the work place and arranging for some outdoor corporate events is a delightful activity for which everyone looks forward for. 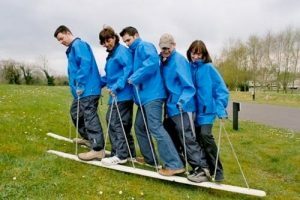 Outdoor team building programs and activities for adults are not just a mere way of adding some fun to monotonous lives but a great way of learning new things, learning to work as a team. 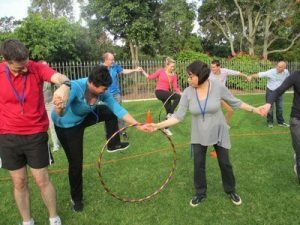 Outdoor team building games for employees are used by many managers to keep their workers happy and energetic and this reflects in their performances. 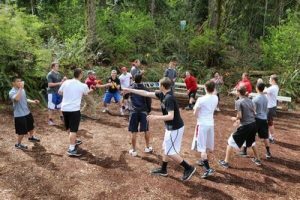 We have often heard of outdoor team building activities for kids but now let us have a quick look at outdoor team building activities for youth. 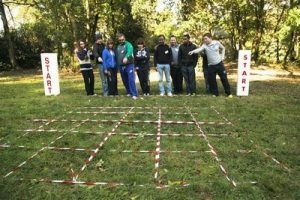 We bring to you the top 10 team building outdoor games for corporate employees that make work more fun and help in breaking the ice which often restricts them from delivering their performance. The team is required to find the hidden treasure using different clues given to them. 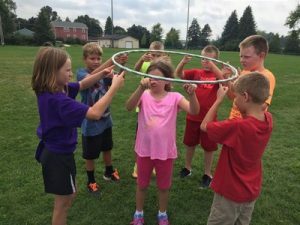 This activity is quite fun and requires team efforts, coordination, leadership skills and problem solving skills to reach to the treasure with combined efforts. Legs of 4-5 team members are tied on the planks on both the sides. Using the ropes attached with the plank, the group has to reach to a certain point. This task involves coordination to lift one leg at the same time so that they can reach the finish line without falling. As the name suggests, the team has to survive in the jungle, facing different challenges they find the setting. 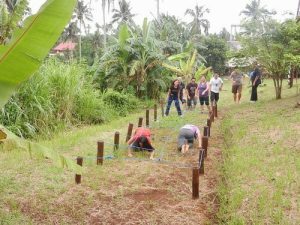 It is a wonderful outdoor group activity which requires leadership skills and problem solving skills to come up with solutions to different problems that come up while living in jungle. One pipe is broken into many pieces and each member is handed over one piece. Now the team has to carry the fragments of pipe like one pipe without breaking the pipeline and reaching the destination in a well coordinated manner. This entertaining outdoor activity involves making a strong raft as a team. 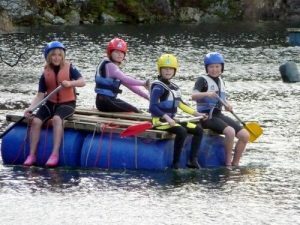 The team is provided with all the raw material to make a raft and has to create a perfect raft which functions properly. 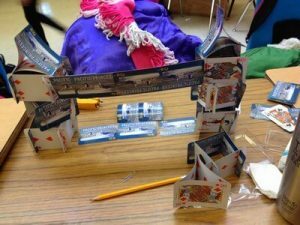 This is a wonderful constructive activity which involves problem solving skills. In this kind of walk, all the team members are required to walk very close to their partners in order to reach the finish line. This demands coordination and synchronization in order to reach the destination and be a winner. You can even take you team out for night camping to any of the places. 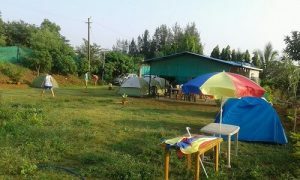 This activity would involve them to set up the camps, prepare bonfire and make meals for everyone. This would involve team building skills and leadership skills to make this outing a success in every sense. Surely, it requires lots of management. Select a few military warfare tasks and allot these tasks to the groups, to accomplish them in a limited time period. You can select these tasks based on their difficulty levels which will require participation and group coordination to finish these tasks successfully. 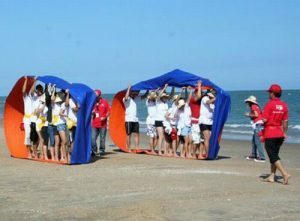 This activity involves transporting the group members from one place to another using the props that are given to them. You have to be creative in using the things that are provided to reach to the destination and make your team a winner. 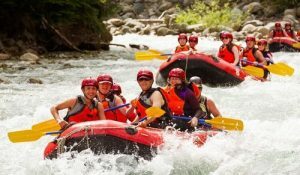 This is another very popular corporate group activity which involves going on a river rafting expedition with your team members. It requires you to face the challenges in the river and reach to the destination with group coordination. 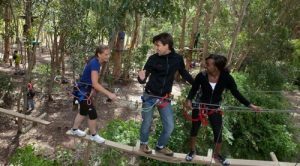 These are some of the most trilling and exciting outdoor corporate events which can be organized to bring together all your employees and have them participate in such fun outdoor team building activities for youth.